Here, I want to explain further why loosening the grip on myself, my experience of reality and being more open to inconceivable possibilities is such a positive experience. 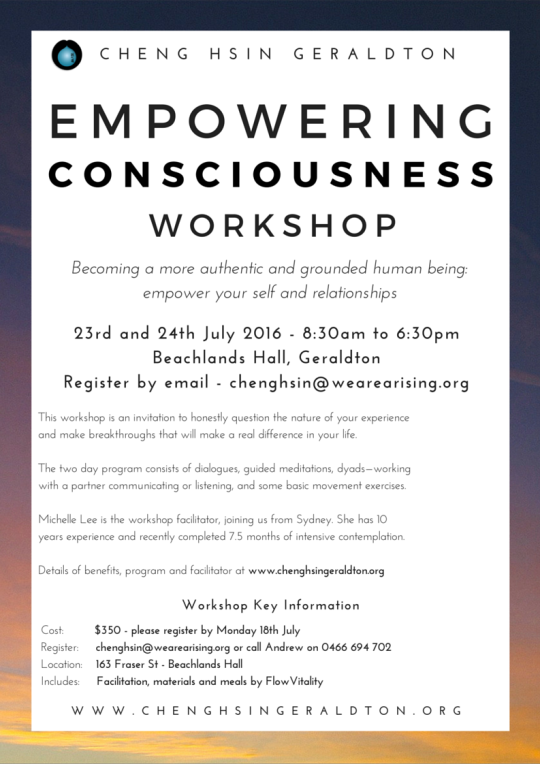 The workshop I did is called “Experiencing the Nature of Being” – created and facilitated by Cheng Hsin founder, Peter Ralston. The purpose is to increase the consciousness of participants through experiential ontological inquiry: seeking direct consciousness of the truth of self, experience, and being. Peter is a truly enlightened being and remarkable facilitator. He, and assistant Brie, guided us through a mix of: structured content, insightful stories, guided meditations and contemplations (solo and in pairs = “dyads”), directly responding to participant questions and facilitating realisations. Peter skilfully guided participants while explicitly avoiding and undermining dogmatic assertions. Instead of telling us ‘the truth’ Peter provides a process and invitation to self-experiments so that we can directly experience the truth for ourselves, in this moment. My experience in the workshop is hard to communicate in writing, but positive beyond my expectations. I’ve done the ‘ENB’ before (documented in a previous post) and other body being / martial workshops, contemplation intensives and eCourses (described on the Cheng Hsin Geraldton site). This most recent workshop in Auckland, NZ stepped me beyond all of those, and I will do it again in the future. By ‘unsettling’ I refer to the simultaneous loosening my certainty about what I am, how my experience is created, and what reality is. Taste for Truth. My appetite for truth and its pursuit have increased. Rather than accept mine or other assumptions or interpretations, I want to investigate the truth: honestly, accurately, openly, unendingly, continuously. The Cheng Hsin community and teacher provide a means to pursue this outside the workshop. State experiences, ‘stage development’ and once-a-year retreats have been put into context, as being no substitute for continuous open inquiry into the nature of consciousness. Insights into Unknowing. I had deep insights into process of perception and cognition, who/where and what “I” am, some of my fundamental operating assumptions and the reality-generating nature of mind’s mechanism of making distinctions. Rather than concrete foundations to stand on knowingly grounded in my self-identity, these insights direct my gaze outwards, unknowing in wonder at possibilities. Substitutes for Self. A crack has been opened in my perceptions of what’s possible: rather than ‘self’ being a distinction within reality, it seems that self – as a principle or the context – frames every experience, every relationship, every object or concept I interact with. This opening creates the freedom to substitute other principles (e.g. honesty) or perspectives (e.g. others’) as the context for experience and interaction. Being Direct. Historically I have doubted, misrepresented, been indirect or inaccurate in communicating my experience. This has multitude effects, including on relationships, decisions and learning ability. I am now more truthful and responsible in communicating my experience, enabling greater integrity and clarity than ever. If this summary sparks some interest, I invite you to get in touch. Or, my strongest recommendation would to engage directly with Cheng Hsin and Peter through the books, podcasts, eCourses and in-person workshops. Here are the links to Workshops, Books, Podcast, and eCourses. I’ve read, listened to and participated in many of these, and facilitated an Increasing Consciousness Group in Geraldton. So, if you want to discuss further or specific recommendations get in touch with via comments on this blog or on Twitter. Although the Empowering Consciousness Workshop is an endeavor that is directed by a facilitator, ultimately you are the one who has to do the work and have the insights. The ECW is a two day event that is designed to be a powerful introduction an an invitation to honestly question the nature of your experience; to make breakthroughs in your own consciousness; to open up new worlds of possibility that will make a real difference in your life. What will you get out of doing this? During the ECW you will be looking into different aspects of your experience of self, communication, and even reality, to become conscious of more effective ways of being and interacting. In this workshop you will question overlooked assumptions, delve into the unconscious mind that is responsible for unwanted feelings and behaviour, seek out a deeper and more authentic sense of personal power, and learn to perceive life in ways that empower rather than limit. You will come away with a new ability to question, a greater understanding of relationship, and access to skills to help you transform in whatever ways you want. Experiential exercises and solo contemplations. Throughout the day you will be introduced to new subjects and will have the opportunity to dialogue with the facilitator to create clarity in your own experience so that the information isn’t just understood but is accessible to you in a way that makes a difference. Michelle Lee was first exposed to Cheng Hsin 10 years ago and last year completed a 7.5 month contemplation intensive as part of an apprenticeship with Peter Ralston, founder of Cheng Hsin. She has co-facilitaetd communication and consciousness workshops in the US and Australia. Michelle has spent thousands of hours contemplating and in communication on these topics,, looking into the nature of herself, awareness and more. In this workshop you will experience a new ability to create genuine inquiry, have empowering insights, and bring consciousness to what it is to be fully human, becoming more grounded, authentic, and effective. Making new distinctions that will empower your ability to communicate more effectively, you will learn how to hear and genuinely be heard by others. Getting to know who you are as a person increases your clarity about what you want from life. Once you create a clear vision then your path to success can be seen and acted upon with greater precision, passion, and effectiveness. You will work to uncover unconscious limitations buried deep in your mind that keep you trapped. By the end of the workshop you will have a greater sense of this domain and the ability to access it, creating the real possibility of new, more empowering ways of being and acting. During this workshop you will be invited to a new perspective that will provide intelligence and effectiveness as well as freedom and power in all aspects of life.